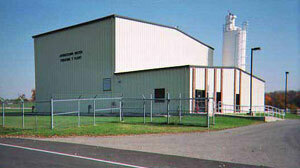 The water treatment plant is located at 395 W. Jersey Street. It is a one million gallon per day facility. 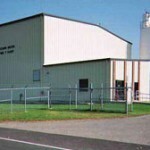 Construction started in the summer of 1993 and was completed in the spring of 1995. The plant cost was approximately two million dollars. The plant uses food grade lime to soften the water. The addition of lime aids in the removal of calcium and magnesium in the water. These two minerals make up the total hardness of the water. Another chemical used in the treatment is polymer. Polymer helps in maintaining the lime sludge blanket within the cone so it will not flow over the weirs and helps the settling process. After lime and polymer is added in the Clari Cone, C02 is introduced for ph adjustment. Water leaving the plant ranges between 7.5 and 8.5 ph value. The last chemical added is sodium hypochlorite. This is added to keep the water bacteria free after it leaves the plant. The plant permit is governed by the Ohio EPA. The water treatment laboratory is certified by the OEPA to run ph, alkalinity, hardness, chlorine and stability tests. Johnstown’s lab has two full lab certified personnel. All other operators are licensed by the State of Ohio to run daily tests and plant composite tests. The distribution system is made up of 22.3 miles of piping ranging in size from 2 to 12 inches. the majority of the pipe is ductile iron pipe ( DIP ) and polyvinyl chloride ( PVC ) pipe. The system also has 202 fire hydrants and numerous valves and continues to grow. The distribution system includes the one million gallon water tower which went online in October 2002. It replaced a 250,000 gallon tower. The newer tower provides increased water pressure throughout Johnstown and keeps Johnstown in compliance for storage meeting the OEPS’s guidelines.